Section Medicare Plans provides an in-depth understanding of all Medicare plans: Original Medicare Parts A and B, Medicare Advantage Plans, Medicare Supplement Plans, and Medicare Prescription Drug Plans (Part D). It also discussed How to Compare Medicare Plans and How and When to Change Medicare Plans. Many of your Medicare questions are addressed and answered. 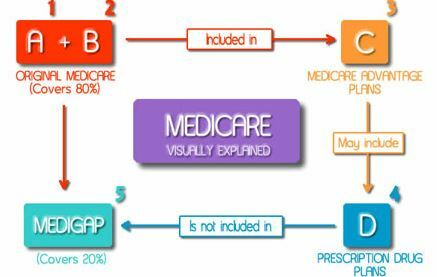 Everything about Medicare Supplement (Medigap) Plans – Eligibility, What do they cover, and Whether you need them. Medicare Supplement Premium and Rating Methods. How to Select Medicare Supplement Plans and Vendors. Changing Medigap plans and Open Enrollment Period. In-depth review of Standardized Medicare Supplement Plans and their benefits. Medicare Advantage Plans: Benefits, Eligibility and Rules for Medicare Advantage Services. Types of Plans, Enrollment Periods, and How to Choose Medicare Advantage Plan. Medicare Part D (Prescription Drug) Plans: Benefits, Eligibility and Coverage Phases. Part D Cost and Enrollment Periods. How to Choose a Prescription Drug Plan. Whether do you need Medicare Part B.
Pros and Cons of Medicare Advantage Plans vs. Original Medicare. How to Compare Medicare Supplement Plans. Key issues in changing Medicare Plans. Enrollment Periods for different types of plans.